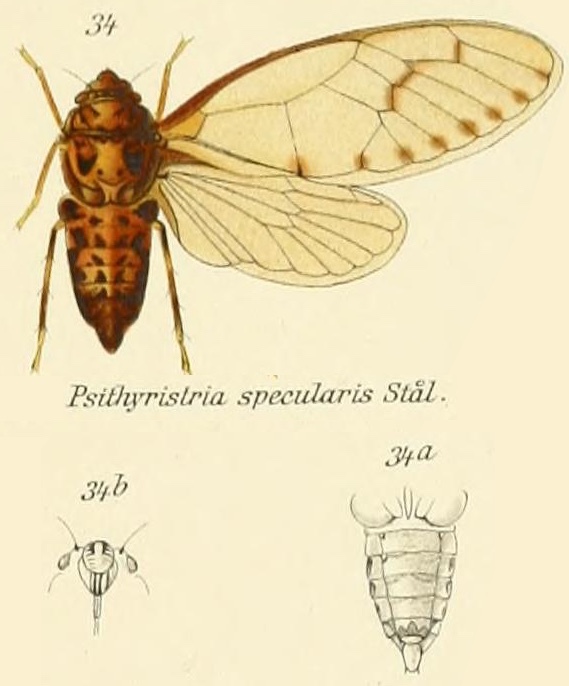 Psithyristria specularis Stål, 1870, is a cicada found in the Phillipines. Characters. — Head (including eyes) considerably narrower than base of mesonotum, tympanal coverings as long as but very much narrower than the orifices, which are thus inwardly exposed; abdomen narrowed posteriorly, a little longer than the space between the apex of head and base of cruciform elevation; tegmina and wings hyaline; tegmina with the venation abnormal; apical areas eight, the lower one very small; ulnar areas much compressed, broad, especially the two lowermost. According to our present knowledge, the Psithyristriaria are confined to the Philippine Islands.